The Cold War (1947-1991) may not seem significant to our current generation, especially in Hong Kong, children these days wouldn’t even know about this and wouldn’t care about it either since it only appears in history textbooks or only were told by the older generations from their experience. If one from our current generation seeks to find out about and feel the impacts that has been brought by the Cold War, visiting Europe would definitely be the best method and this was my main purpose of joining the tour. I have not set foot in European soil since visiting the United Kingdom and France back in 2013. The route of this tour focuses on the eastern side of Europe including 2 former Eastern Bloc countries – former East Germany and Czech Republic. Once setting foot in Berlin, the atmosphere was definitely different from the ones of London and Paris, things seem to have be dimmer, even the time seemed to had flown slower, it wasn’t the cultural nor political differences, the tourists attractions were as crowded as any other tourists attractions in other parts of the world, and in particularly areas that once belonged to East Germany, it just felt similar to those developing areas back in the Mainland of China. The abandoned blocks of resettlement buildings, the non-continental style structures, the recently repainted old estates, are the remains of what the communists had been developing back in the days. 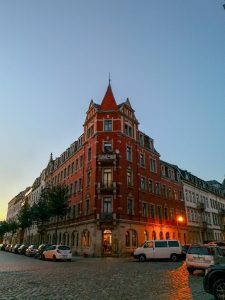 This phenomenon is rather significant in Berlin than the other places that we have visited since it had been the center of influence and within the city itself it had been split between the Eastern and Western Bloc. It is obvious that areas that once was under the influences of the USSR has developed less than that of those on the opposite side. There are clear records of each city’s commodity price in Germany and Berlin is not even ranked top 5. The size of Berlin’s international airport also supports this, as the capital’s airport, its size is even smaller than that of Munich’s. According to the tour guide, this was caused by the insufficient of area in the France’s territory of Berlin back in the days of the Cold War, once again caused by the split of Berlin. Small cities were not that affected by the Cold War. Small towns like Potsdam and Weimar were able to maintain the traditional atmosphere since they weren’t the targeted to-be-developed areas of the communists. Little were converted into communist style such as adding a big red star onto the flowerbed at the entrance of the Cecilienhof Palace. 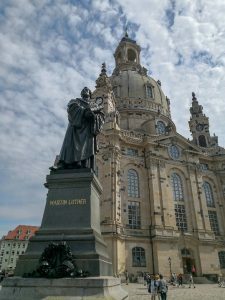 On the contrary, major cities like Dresden were greatly rebuilt from the destruction caused by WWII into communist modern styled similar to that of the eastern side of Berlin while also rebuilding some traditional buildings such as the Zwinger Palace. Although some old buildings only get to get reconstructed after the Cold War like the Frauenkirche. I would not say that Prague is less advanced in terms of technology and development, it has the prosperity of a developed country but the “atmosphere” was still there, although not as rich as it has been in Berlin. The main reason for this might be that the government of Czech has placed their focus on the development of tourism which allows tourists to be intoxicated by the beauty of the city. The city for sure has preserved of what was left from the baroque period, the red tiled roofs, stone paved floor, small stylish balconies but also some random communist structures which proofs that it has stand the time under communist influence. It was also quite hard to find any definite answers or detailed information within such a short period of time. This trip though has given me an idea of how different it could be between the former Eastern and Western Bloc countries although it has been almost 30 years since the collapse of the USSR and there are still much more to be discovered on this topic. Other former eastern bloc countries should also be visited, some of which are Poland, Hungary, Slovakia etc. Also, in a Chinese saying, “The information gained from an actual exploration is much greater than the knowledge that could be learnt from reading thousands of books”, so in order to find what I seek for, I will definitely return in the future.